At the Strömsholm Riding School, Sara Grundström and Stina Burström in 2004 undertook a blind study that was conducted on horses with back problems. The results of this study are most certainly applicable to humans as well, especially since horses are not prone to the psychological influences of humans. Test results prove the Back on Track effect: Back on Track fabric technology significantly increases circulation. General Benefit: Back on Track fabric technology significantly increases circulation. 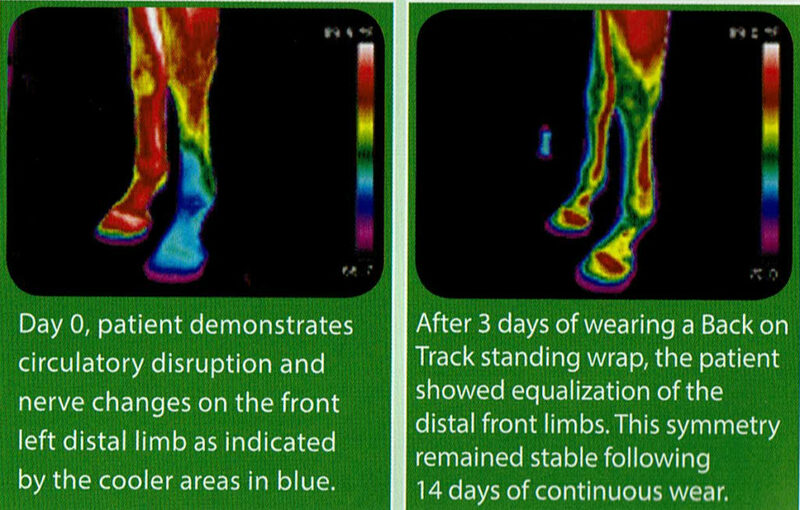 “Southern Pines Equine has used the Back on Track bandages and blankets in our bone scan horses to keep the legs and back warm and maximize circulation. To get good scan images, good circulation is critical! We have compared regular leg wraps to the Back on Track bandages and have documented significant increases in circulation. We are able to do this by comparing tissue activity count rates on legs that were either left open or covered with a standard bandage or the Back on Track wrap. Our count rates (Kcount/sec.) were 50% higher in the legs covered with the Back on Track bandage. The positive effect was also seen in the stifle and pelvis with use of the Back on Track blanket. LEGS: Significant results can be seen in just 3 days. Day 0, patient demonstrates circulatory disruption and nerve changes on the front left distal limb as indicated by the cooler areas in blue. After 3 days of wearing a Back on Track standing wrap, the patient showed equalization of the distal front limbs. This symmetry remained stable following 14 days of continuous wear. 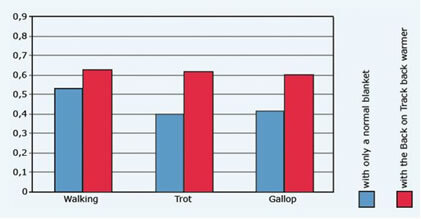 Study performed by Joanna Robson, DVM, CVSMT, CVR, CSFT, CIT, Inspiritus Equine Inc., Napa, CA. “We have shown that heat will result in alterations in the body, which will diminish pain and chronic inflammation”, says Thomas Lundeberg, associate professor in physiology at the Karolinska hospital (ref; The Swedish journal Health “Hälsa” nr 9, 2000). A doctor interested in this subject is Dr Rose-Marie Brinkeborn, who has conducted a clinical study on the efficacy of Back on Track braces together with colleagues and physiotherapists. The study included 120 patients who had experienced pain caused by either arthritis of the knee or tennis elbow for a period of at least 3 months. The subjects were randomly separated into two equal sized groups, and their levels of pain were immediately evaluated on a scale ranging from little pain to considerable pain. One group of patients were required to use the braces for a three week period, then stop using them and revert to their own previous methods of pain management for the next three weeks. Simultaneously, the other half of the patients, who had been instructed to rely on their normal methods of pain management for the first three week period, were now instructed to use the braces for the ensuing three weeks. The overall results of the study are not yet finalized, but it has been established already that more than half of them had less pain when they were using the braces. Those with tennis elbow often went back to normal, and some of the patients with knee arthritis, who had been living with pain for a long time and were booked for prosthesis surgery, felt so relieved from pain that they could exercise again, and chose to postpone their surgery! An example of how the study subjects evaluated pain on a scale (visual analogue scale). Movement capability was also evaluated in a different diagram. “So far there is no subject who has not had some kind of improvement with these ceramic braces”, says Dr Brinkeborn to the journal Allas early on in the study. NASA Space Technology Shines Light on Healing. Effects of infrared radiation on intraosseous blood flow and oxygen tension in the rat tibia. Kobe J Med Sci. The restorative effects of pulsed infrared light therapy on significant loss of peripheral protective sensation in patients with long-term type 1 and type 2 diabetes mellitus. Acta Diabetol. Back on Track are a company that produce a range of therapeutic products for horses, humans and dogs that work through the utilisation of properties of ceramic particles and infrared radiation. This study was conducted on 44 randomly selected horses, and sought to investigate the changes in locomotion resulting from the use of “Back on Track” therapeutic rugs. Locomotion was measured in three ways; fore limb stride length (FLSL), hind limb stride length (HLSL) and hind limb protraction (HLP). During the experimental periods there were highly significant improvements (P<0.001) in all three measurements, while there were no significant improvements in any of the three measurements during the control periods, although there were deteriations. The results of this experiment not only provide evidence of the efficacy of the “Back on Track” therapeutic rugs, but also lend support to the wellbeing and performance enhancing effects of infrared radiation.